The Little Big Shot Super Nozzle is pound for pound the most effective, water-efficient nozzle you can buy. Fits any standard hose and adjusts from powerful sweeper to spray for watering plants, to even a pin point stream! Manufactured from solid brass, the Little Big Shot weighs only a fraction of other adjustable nozzles, requiring far less material from our environment to make. 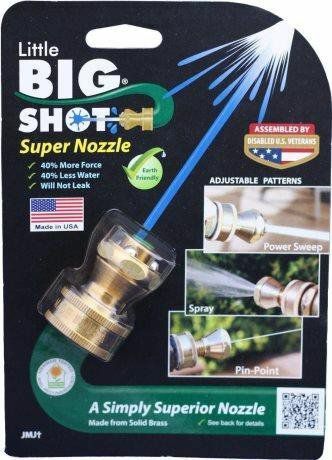 The Little Big Shot Super Nozzle is a simply superior and EARTH-FRIENDLY hose nozzle! Little Big Shot is Made in the USA and assembled by disabled US Veterans. It's earth friendly! It's water efficiency is simply remarkable, with 40% less water volume (GPM) than the 'classic' pistol nozzle when tested at full-open position 40% More Force As a sweeper, it delivers a surprisingly powerful force, 40% more than the Water Jet™ power washer at full-open position, for quick and efficient sweeping jobs. With our space-age Perma-Washer™, the Little Big Shot™ Super Nozzle will not leak. Less Material Required The Little Big Shot™ Super Nozzle is precision crafted from solid brass. And, at a fraction of the weight of other adjustable nozzles, it requires far less material from our environment to make! YOU CAN BUY A BIGGER NOZZLE... but you won't get bigger performance or more Earth-Friendly than the Little Big Shot™ Super Nozzle! That's why the Little Big Shot Super Nozzle is Earth Friendly! Don't take our word for it, see what real customers had to say! You Tube Video - Little Big Shot Works! 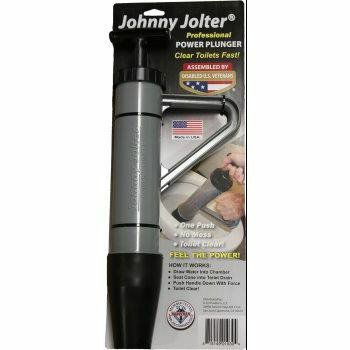 The Johnny Jolter Professional Power Plunger is the most effective toilet plunger available today at any price. 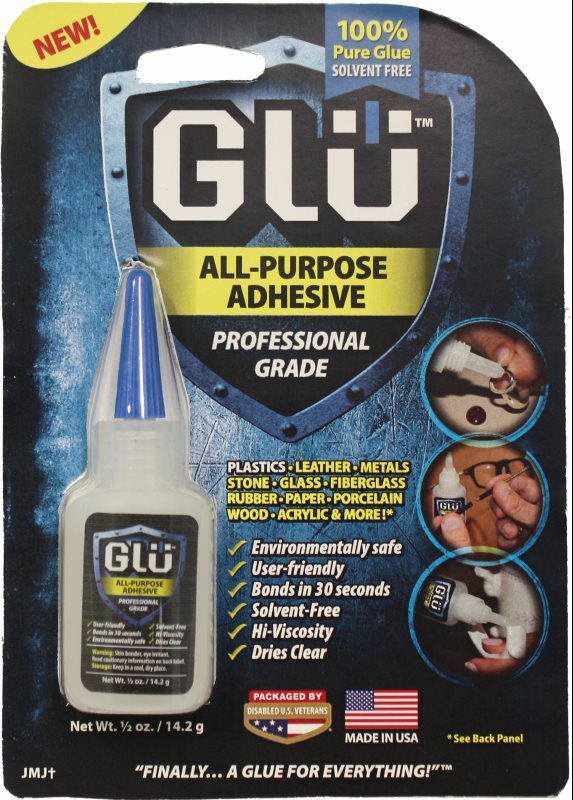 Used by Professional Maintenance companies, this hi-quality, made-in-USA product is now available to the homeowner. It works by drawing water into the chamber, then forcing it back through the blockage. Clears toilets with just one push. No Overflow Mess, No Cartridges to replace. Easy to maintain, clean and store for the times when you need a quick fix to a plugged toilet! Use what the professionals use and FEEL THE POWER! The Johnny Jolter Professional Power Plunger: One push, no mess, toilet clear! "As seen in the press"